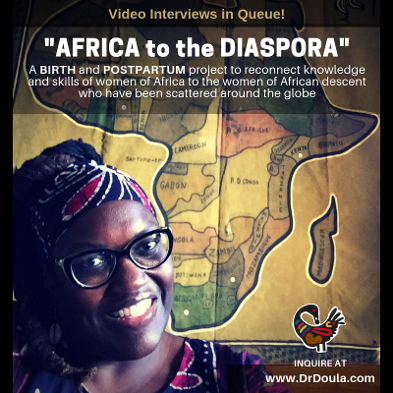 The "Africa to the Diaspora" Birth and Postpartum Project is a collaboration between Harmonic Connections PLUS (Daughters of the African Diaspora) and Sankofa Birth which is intended to "reconnect knowledge and skills of women of Africa to the women of African descent who have been scattered around the globe." Dr. Doula (Andrea Little Mason, Ed.D.) is conducting video interviews with women of each of the 54 African countries and diverse tribal groups. The objective of this enormous project is provide a video resource collection for women of African descent around the world who desire to learn about diverse African cultures that may make up their lineage, while considering some birth and postpartum traditions that may still be a part of their family having transcended time and dislocation from the continent. In honor and celebration of the women who continue to serve as keepers of birth traditions and indigenous practices throughout Africa, Daughters of the African Diaspora is awarding portions of the proceeds from the "Africa to the Diaspora" Project to women and organizations who are working to preserve indigenous traditional birth and postpartum practices among people of African descent on the continent and throughout the diaspora. The Journey to Sankofa Award will be awarded to Diasporic African women who seek to reconnect with traditional practices through attendance in classes and workshops about herbalism, birth support, lactation, etc. The Birth Wisdom Award will recognize nominated African women living on the continent of Africa for a lifetime of work with birthing mothers while "preserving, protecting and promoting" indigenous birth and postpartum wisdom. The 40 Days Postpartum Recognition Award which will be awarded to groups and organizations on the continent who are committed to supporting the women who support new mothers during the postpartum period (the 4th trimester) with traditional postpartum practices. We are excited about the opportunity to honor and celebrate those who are responsible for allowing these Indigenous Knowledge Systems to continue to survive and serve humanity alongside modern medicine and technology. If you or someone you know is able to contribute to this endeavor, please contact Dr. Doula.